The year’s collection of the best riding lawnmowers is heavily represented by the European Husqvarna brand. 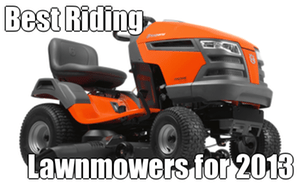 If you’re looking to buy American, however, you’ll be happy to know that we found three American models that deserve to be ranked among the top rated and reviewed riding mowers of 2013. Topping off this year’s list is a Husqvarna hydrostatic transmission model priced at under $2000. You should have no problem starting the 23hp two-cylinder Briggs & Stratton Intek push-button engine, which packs plenty of power to tackle overgrown grass. The cruise control feature practically mows straight lines on its own, even on inclines. 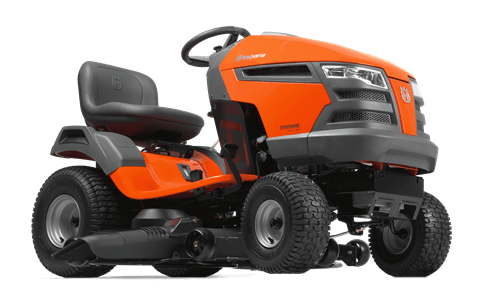 Also incorporated is Husqvarna’s own Air Induction technology that provides a more consistent cut and better grass clipping management by drawing air from the top and bottom of the deck. An easily accessible fender-mounted cutting height adjuster allows you to choose from a 1.5 to 4-inch cut while on the fly. The spring-assisted 48” deck contains a hose wash port for easy access to clean the deck’s underside, and the built-in hour meter is useful for tracking a maintenance schedule. The Husqvarna’s Tuff Torq transmission provides a smooth, consistent, and comfortable ride both forward and backward. Twin pedals control speed and direction, leaving both hands free for improved driving control. Husqvarna clearly had comfort in mind when they designed this unit, which boasts an adjustable seat, angled ergonomic steering wheel, wide step-through, and accessible cup holder. Power, price, comfort, and consistency are backed by Husqvarna’s 2-year limited warranty, so consumers don’t have to sacrifice functionality or design for an affordable price. For a smaller, less powerful version of the Husqvarna YTH23V48, check out the YTH2042. This model features a 20hp Briggs & Stratton engine and 42” deck for $500 less. Once again, the Pony earns a spot among the best riding lawnmowers, a true testament to its rugged durability, solid handling, and attractive features. There’s a reason consumers have rated this model consistently at the top of the charts for a couple of years, and it again finds itself a favorite in 2013. An excellent product for cutting level fields, the solid steel construction unit is among the highest rated in consumer reviews. The 42” deck has a side discharge and the cutting height adjustment provides cuts that range from 1 to 5 inches. Be prepared for a learning curve while getting used to two safety features. Consumers have voiced their frustration with having to disengage the blade prior to backing up, which means no reverse mowing, although some who are brave enough to dabble with the wiring discovered how to disable this feature. Disengaging the blade can also be an annoyance when mowing steep inclines, but the Pony will have enough power to get you where you’re going—if but slowly. Also, a reassuring shut-off feature kills the engine if the operator leaves the seat without having the brake on, but some consumers find this feature to be much too sensitive over bumps. 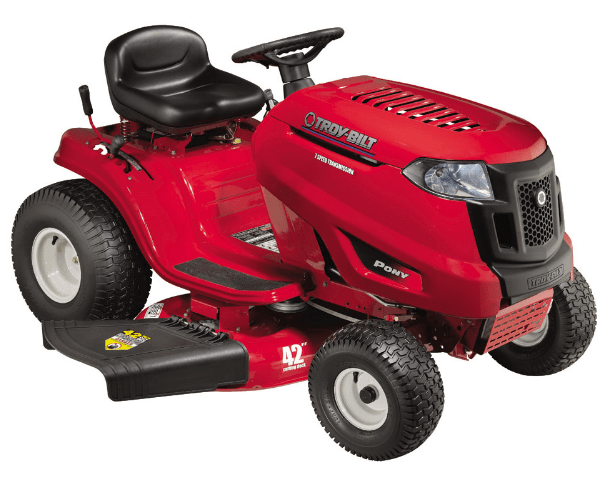 Most agree that Troy-Bilt’s Pony features a solid 17.5hp single cylinder Briggs & Stratton engine and is an excellent value for about $1000. The 7-speed Shift-on-the-Go transmission combined with buttery steering makes this power tool almost effortless to operate. We love that this reliable yet economical unit frees up cash to be used on various Pony attachments such as the bagger, mulching kit, snow plow, tractor cover, or convenient sunshade. Although more expensive than the Husqvarna YTH23V48 and Troy-Bilt Pony, the John Deere D170 outpowers both units with its 26hp that won’t get bogged down in tall or wet grass. Like the Husqvarna, two foot pedals contribute to an easy drive even for larger lawns, but the reverse pedal is slightly awkward to trigger. The deck height handle could be better repositioned; some users experienced difficulty dismounting without accidentally bumping the handle. Its 54” deck, short turning radius, and forward speed combine to shorten mow time so you can spend more time on other projects (one consumer mowed 1.5 acres in 20 minutes). Plus, it’s good on gas. As if performance weren’t enough, the D170 features operator conveniences such as a color-coded control panel. Cruise control is activated by a lever, and the engine is started with an electronic ignition on the dash. Both a storage compartment and cup holder are within reach. This model earns an impressive average of 4.5+ out of 5 stars from almost 60 homedepot.com and lowes.com reviewers. If you value comfort, some of these reviewers claim that this unit’s adjustable lumbar seat is the best on the market—a statement not to be taken lightly. At almost $3000, we’d expect the D170 to be extremely comfortable. The Husqvarna RZ4621 is a zero-turn mower, which ups the price slightly, but it still out-prices the John Deere D170 by a few hundred dollars. 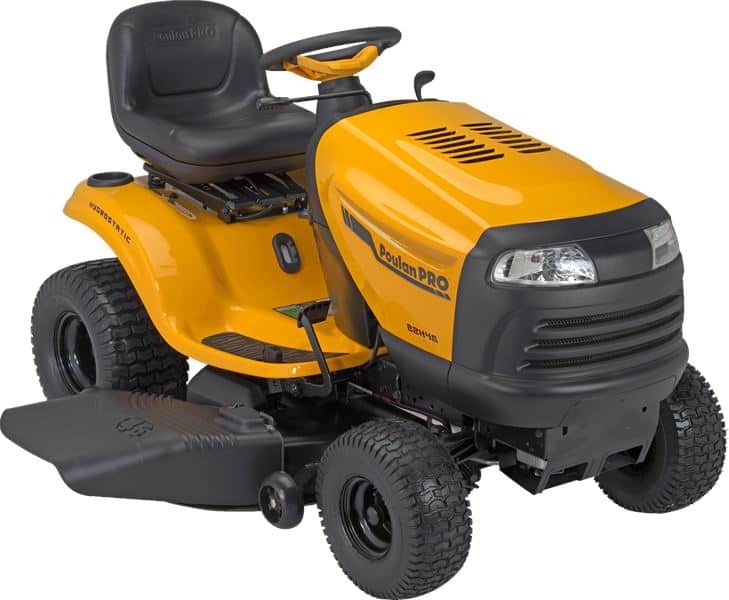 Compared to the Husqvarna YTH23V48, this unit sacrifices 3hp of its twin-cylinder Briggs & Stratton engine and 2” of deck width for zero-turn functionality. Dual foam-padded adjustable levers put you in the driver’s seat, and consumers recommend a test drive prior to mowing near flower beds or trees in order to get a feel for distance and turning. Owners claim this unit is capable of replacing a gas push mower that would otherwise be necessary to maneuver into tight spaces. 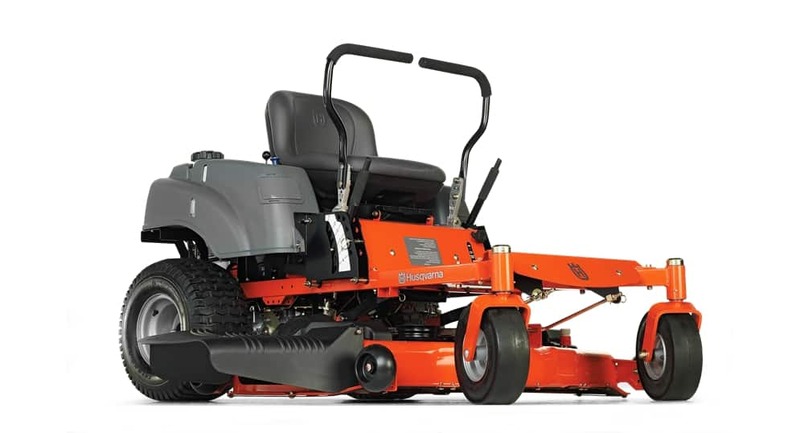 Like its cousin Husqvarna YTH23V48, the Air Induction technology is present, allowing for an optional mulching function, and it also offers a deck washout hose connection. Excessive deck vibration has been noted as an issue, so if comfort is more important than zero-turn, check out the John Deere D170 instead. While a serious selling point of the RZ4621 is the maintenance-free hydrostatic integrated transmission (no fluid changes required), consumers have detailed a number of early repairs with this unit, particularly regarding the tension spring and drive belt. If you are a conservative buyer who worries about dealing with new feature bugs, consider a different unit. The Craftsman reputation alone attracts many potential buyers. But when you throw in a tight turning radius of only six inches, it’s clear why 200 users rate the machine 4 out of 5 stars on sears.com. 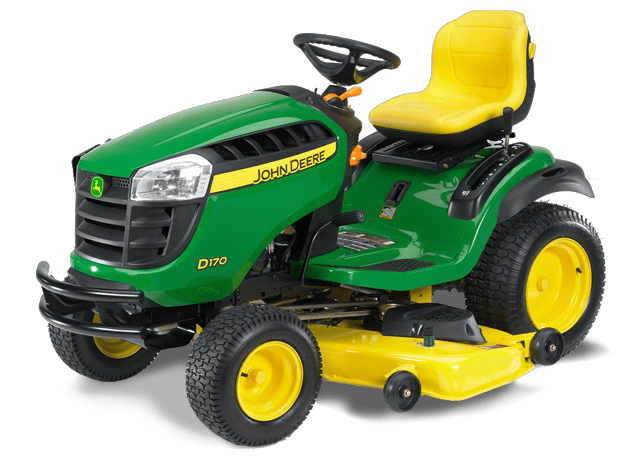 The 28851 is a smaller machine with a 42” deck, 21hp single cylinder Briggs & Stratton engine, and hydrostatic transmission, yet it moves forward at a speed equal to the John Deere D170, providing a quick mow time. One sears.com reviewer experienced a time savings of two hours. 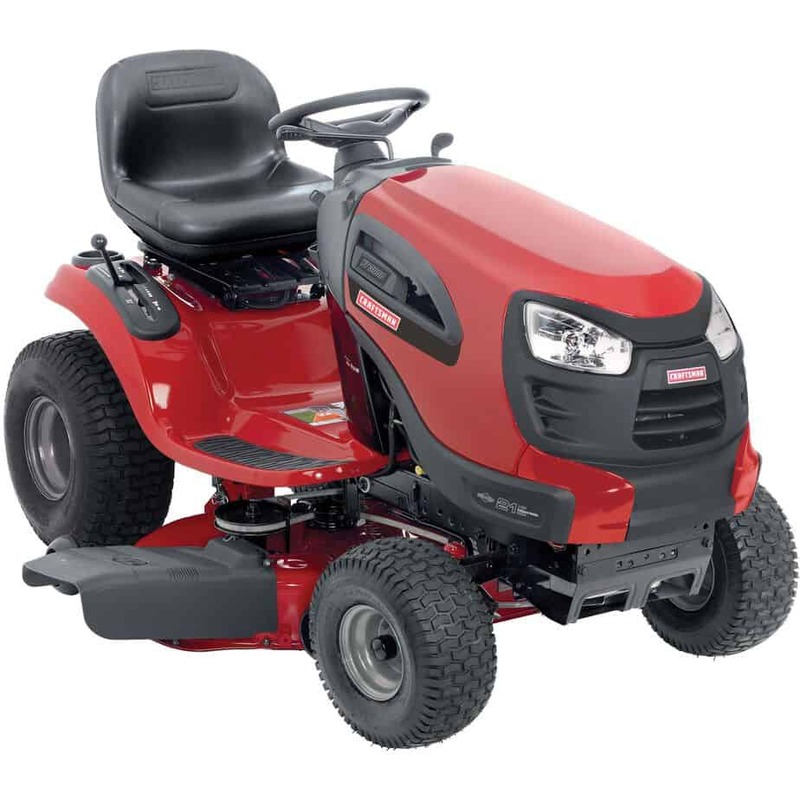 The easy step-through and high-back sliding seat are favorite features, but like the Troy-Bilt Pony, it features a reverse mowing safety lock. Unlike the Pony, this mechanism is easily disabled by pushing an ignition key switch. Multiple consumers express frustration with the poorly placed deck height adjustment lever, which projects outward and can get stuck on shrubs, branches, or even your leg while dismounting. The cutting height can be adjusted from 1.5 to 4 inches. You can get this entry-level machine for about $1500—even cheaper if you take advantage of a Sears financing promotion. Expect the 28851 to provide an even mow with no low or high spots like the height differentials that have been reported with the Husqvarna and John Deere models. We wanted to at least mention the Poulon Pro PB22H46YT unit made by Husqvarna. While the product has received overwhelmingly favorable consumer reviews, there have not been enough ratings to thoroughly assess it. It features a two-cylinder 22hp Briggs & Stratton engine and the option of a 6-speed or hydrostatic Tuff Torq transmission. Its 16” turning radius is wider than some models, but its large 46” deck is impressive, rivaling the Husqvarna RZ4621. This unit comes with a price tag of about $1700, which might be too high to entice buyers. Do you agree or disagree with these picks? Own one of these units and want to let others know what you think? See something we left out? Leave a comment! Bad: Poor choice for St. Augustine lawns — blade height is too low even at maximum setting. Good: easy to disengage “no mow in reverse” by simply unplug a wire found under the chassis near left rear wheel.